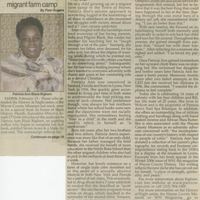 A newspaper article about Patricia Ann Black's (1956-) experience as the child of migrant workers Pilgrim Black (1905-2002) and Lula Mae Haynes Black (1917-2007), who got married in 1937. as the daughter of Pilgrim Black (1905-2002) and Lula Mae Haynes Black (1917-2007), who got married in 1937. Patricia was born August 31, 1956, and grew up at the end of East Tenth Street in Sanford, Florida. She attended Hopper Elementary through sixth grade, Lakeview Middle School for seventh grade, Sanford Junior High School for eighth grade, Crooms High School for ninth grade, and Seminole High School through twelfth grade. She also attended school in the North Rose-Wolcott district each year while in Upsstate New York. During fourth grade, integration began and parents were given the choice to have their children to attend other schools, but Patricia chose to continue attending an all-black school until she entered seventh grade in 1968 and began attending integrated schools. Original newspaper article: Rogers, Pam. "Memoirs of Life in a WC Migrant Farm Camp." The Sun and Record, February 23, 2006: Private Collection of Patricia Ann Black. Digital reproduction of original newspaper article: Rogers, Pam. "Memoirs of Life in a WC Migrant Farm Camp." The Sun and Record, February 23, 2006. Originally created by Pam Rogers and published by The Sun and Record. Copyright to the resource is held by The Sun and Record and is provided here by RICHES of Central Florida for educational purposes only. Rogers, Pam. 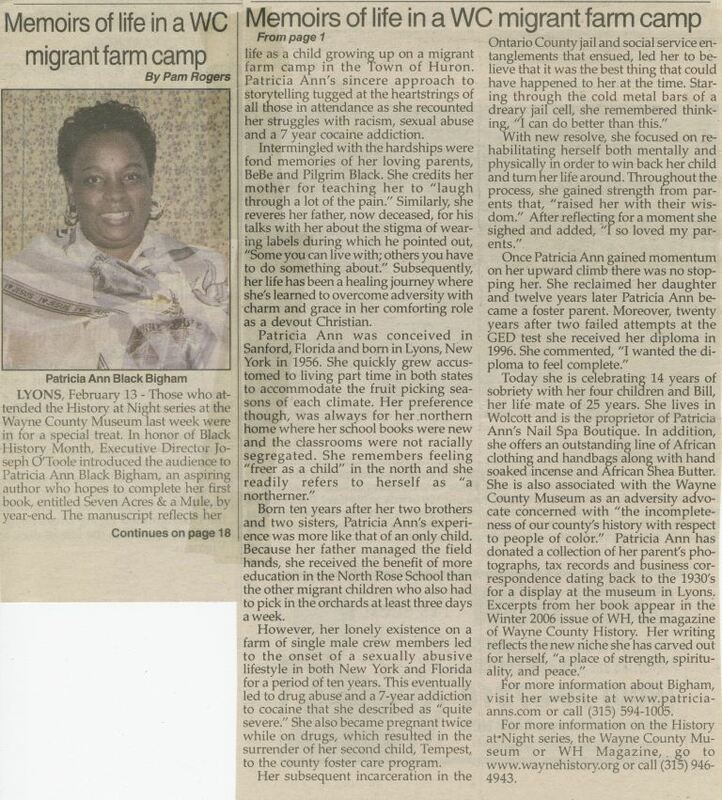 “Memoirs of Life in a WC Migrant Farm Camp.” RICHES of Central Florida accessed April 20, 2019, https://richesmi.cah.ucf.edu/omeka/items/show/3003.